Just a few short miles from downtown Greenville, SC, named #3 Small City in the USA by Conde Nast Traveler and “One of the South’s Best Cities” by Southern Living Magazine—you’ll find the charming community of Hartness. Named for the family that owns the land on which the community sits, Hartness is designed according to the principles of Traditional Neighborhood Development—walkable streets, a wide range of homes built to last, and a Village Center, complete with restaurants and shops. Within five minutes’ walking distance from every home, you’ll find an amenity worth visiting—whether it’s a thoughtfully-designed park, a hardscaped plaza, or the Village Center itself. 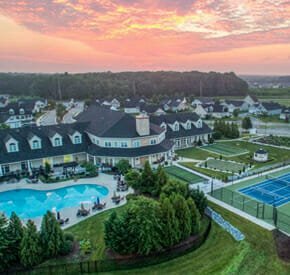 The community also features 180 acres of nature preserve threaded with 15 miles of trails that are perfect for hiking, biking, or just getting lost in the beauty of Greenville’s countryside. The Hartness family could have chosen many different paths for the 400+ acres of land they’ve called home for decades. In fact, Thomas “Pat” Patterson Hartness and his wife Mary Lou Hartness still live on an estate located on the property that Pat began acquiring in the 1970s. 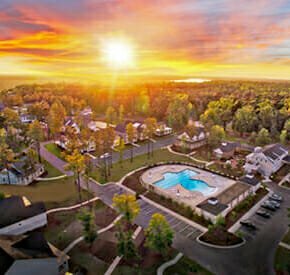 Instead, they chose to develop the land themselves, to create an idyllic retreat just 15 miles from the heart of downtown Greenville. The Hartness’ Greenville legacy began in 1940, when Pat’s father, Tom, purchased the local Pepsi-Cola bottling rights—an endeavor that led to the evolution of a successful packaging company with a wide network of global contacts. Pat became the CEO of Hartness International and Sean served as a senior executive before the family decided to sell the company and pursue other avenues—and they are on track for the Hartness community to be just as vibrant a venture. If you dream about a new home in a warmer climate with modern design, amenities, and low maintenance, then you owe it to yourself to learn about a powerful alternative to using traditional financing or paying cash to purchase your next home and doing all of this while retaining a large portion of your life savings with a Home Equity Conversion Mortgage (HECM). Ken and Karol Iberg had this dream and their dream became a reality. “At the time, we were living in a small townhome with a single car garage. Our loan officer explained how the HECM would allow us to move into a wonderful new home community that we are thrilled with. We supplied some of the equity from the sale of our townhome and used the HECM loan for the rest of the purchase price. The best part is we do not have a mortgage payment, didn’t touch our retirement funds, and now have additional funds to do all the traveling that we have always wanted to do,” said the Ibergs. If more P.I.E. in your retirement sounds appealing, it might be worth your while to look at the HECM for Purchase option as you contemplate buying your dream retirement home. *Buyers remain responsible for the ongoing payment of property taxes, homeowner’s insurance, and any required association dues. They must also maintain the property to minimum property standards. Ideal-LIVING is excited to announce the first Ideal Cottage in the Rocky Mountains. Red Ledges exemplifies the ideal lifestyle through its outstanding amenities, incredible views, and stunning architecture. The Red Ledges Ideal Cottage was an easy first pick. Red Ledges, a private Rocky Mountains community, sprawls across the Heber Valley about 20 minutes from Park City, UT. Red Ledges members have easy access to Salt Lake City and its international airport, a Delta hub. Both are a short 45-minute drive away. 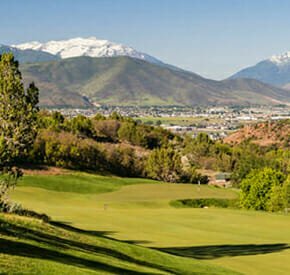 Year round outdoor sports and activities offered in and near Heber Valley attract vacationers and homebuyers from around the world. And, Red Ledges’ amenities, extensive activities’ program, and resort-style living exceed expectations. A something for everyone mentality delivers the ideal destination for all ages. Mother Nature’s majesties are prevalent here. From the top of the region’s pristine and rugged mountains, down world-class slopes, and along miles of moderate to extreme biking and hiking trails, the region offers the most dramatic of terrestrial landscapes. The famed Deer Valley and Sundance ski resorts are only minutes from Red Ledges’ gates. In June of this year, Expedia named nearby Heber City one of the 10 “Most Beautiful Towns in America”. And, where there’s excessive natural beauty, there’s fame, fortune, and the Olympics. Heber Valley was the site of the 2002 Winter Olympics and is the annual home of the world-renowned Sundance Film Festival. Quite naturally, a vibrant culinary scene follows. The restaurant scene is as fine-dining and James Beard friendly as it is family-friendly. Heber Valley boasts both international and family dining options. On par with the community’s high standards, the Red Ledges Club employees the area’s most talented chefs. Essentially, as a Red Ledges home owner and member, one has access to everything: the excitement that accompanies an-uber popular international destination, and a scenic, private place to tuck away in. Red Ledges started as the dream of a Fortune 500 CEO whose wife grew up in the Heber Valley. Hundreds of families purchased and built in Red Ledges in the first decade of development. It was an ecologically prudent development, offered exceptional amenities, and was located at the epicenter of outdoor fun. What more could a second homeowner ask for? Yes, golfers are indeed in luck here. Not only is golf at the heart of the community, the 18-hole Jack Nicklaus Signature Course was named the “Best New Private Course in America” in 2009 by Golf Magazine. Red Ledges is also the first ever 12-hole Jack Nicklaus Signature Golf Park. Looking for other amenities? Start with the Cliff Drysdale Tennis School which offers programs by the U.S. Open doubles champion and ESPN commentator. Then, there’s the onsite equestrian program offering organized group and private trail rides, winter sleigh rides, and private horseback riding lessons. And, a third, but far from last on the amenities list is the Swim and Fitness Center. It welcomes a range of fitness opportunities and will include a resort-caliber pool and aquatic playground in 2019. The Red Ledges Club’s “Director of Fun” coordinates and curates all activities. Real estate doesn’t stick around long here. 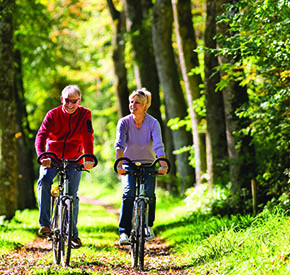 The community’s master-planned options for retirees and vacationing families are unparalleled, and therefore coveted. Estate homesites, luxury cottages, villas, and club cabins don Red Ledges’ neighborhoods. As a result, Red Ledges Realty, the community’s on-site sales office, has expanded both its staff and its offerings. Additionally, they recently established a partnership with ideal-LIVING. The Ideal Cottage was designed to showcase the amazing views of Mount Timpanogos. And, that it does. With copious amounts of room in the cottages two-story social spaces, they feel as much like viewing areas as sitting rooms. And, three bedrooms (all including en suite baths), and a total of 3,269 square feet the Ideal Cottage is all the space vacationers need. Naturally, the cottage’s outdoor living spaces are also quite dreamy. Each has a fire pit to warm up chilly evenings. Red Ledges Construction is the most active homebuilder in the 2,000-acre community. And, Rex McGuire, recently hired as Red Ledges’ Vice President of Operations, is in the driver seat. McGuire is the head of Red Ledges Construction, the Ideal Cottage builder. With 20 years in the high-end quadrant of the building industry, McGuire is poised to stimulant responsible growth. While he has extensive experience in development, operations, and construction management, land planning and green building technology are also in his wheel house. As one might expect, there are many exceptional designers in Heber Valley region. But, there are few like Kevin Price Designs, the firm responsible for the ideal cottage. Over the last 39 years, Kevin Price has designed homes of various styles in locations across the globe. Based in Park City, UT since 1994, Price has designed over 100 custom homes in the Park City area alone. And, the press loves him. Consequently, design magazines and various television shows have consistently featured Price’s work. The equally talented decade-old Park City firm Alder & Tweed, designed the cottage’s interiors. While Alder & Tweed’s interior designers specialize in high-end international furniture procurement, luxury vacation home outfitting, and office design are also among their specialties. Alder & Tweed’s design philosophy is to create an interior that marries your personal style with the magnificence of resort living. Keith Van Dyke, and Red Ledges Construction’s Kelly Cook and Greg Adamson managed an array of superior subcontractors. Red Ledges would like to extend their gratitude to all involved in creating the Ideal Cottage. The gorgeous results and high demand speaks to their effort. Explore the Ideal Cottage below. Looking for other ideal destinations? Find others here.